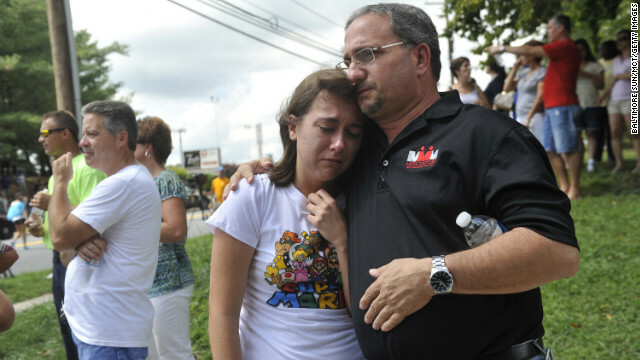 Julianna DiPaula hugs her dad John DiPaula after they are reunited following a school shooting in Perry Hall, Maryland. Editor’s note: Robyn Barberry teaches English at an alternative high school and a community college in Maryland. 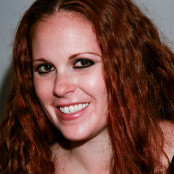 With her husband, she manages Legends of the Fog, a haunted attraction with more than 200 teen volunteers. She has an Master of Fine Arts in creative nonfiction from Goucher College and blogs about motherhood for The Catholic Review. (CNN) – On the first day of classes late last month, I kissed my little boys goodbye and updated my Facebook status: “Wishing all my teacher friends a happy new school year!” I rushed to my classroom at an alternative high school near my home outside of Baltimore. When I turned on the LCD projector, a soft glow of dust-speckled light hit the stark white screen, and displayed the words “Welcome back!” I was prepared for everything except what happened. When I was leaving the office, the school resource officer stopped me. “There was a school shooting today...in Perry Hall,” he told me. I must have stared at him for an entire minute before I could speak. Shootings didn’t happen anywhere on the first day of school. Certainly not in Perry Hall. The officer was armed with a badge, combat training and a service weapon, and he wasn’t prepared for this, either. He said a lone gunman had shot one person in the back, and that he’d already been apprehended. There was no word on the victim’s condition. This wasn’t the way the first day of school is supposed to be. The beginning of a new academic year offers a clean slate for teachers and students alike. We debut new, improved versions of ourselves. “This year we will shine,” we convince each other. Dreams like this are never deferred by the crack of a shotgun across a school cafeteria on the first day of school. (CNN) - Rather than spending their eighth-grade year at Athena Middle School, the three students who verbally savaged bus monitor Karen Klein have been suspended to the Greece, New York, school district’s reengagement center and will complete mandatory community service. Though their punishment exceeded Klein’s desire for the boys to lose their bus and extracurricular activity privileges, most people are satisfied with this story’s ending. For people like me, this is where the story begins. No matter how many poor choices teenagers make, only one - the decision to drop out - can prevent them from earning a high school diploma. Expelled students may lose the right to attend their home schools, but they are still legally entitled to an education. For this reason, public school systems have alternative programs, like the one in New York that the bus bullies will attend and the one in Maryland where I teach high school English. Alternative education is widely misunderstood. It’s not prison. It’s not “let’s-talk-about-our-feelings” camp. It’s not a delinquent storage facility. It’s a second chance at learning, where the district curriculum is upheld, rules are enforced and rehabilitation can occur. The alternative school atmosphere is not as tumultuous as one might think. It’s more like the day after a major storm has occurred. The tension has not fully evaporated. Shards of debris are all over the place. Loss is catastrophic. There is a genuine state of emergency, but the real danger has passed. It’s time to rebuild.